There and Back Again: Worst Start to a New Year ever? Worst Start to a New Year ever? Hello friends and family! I have nothing fun to update you with. In fact, it's all a bit miserable. You see, this new year should have been filled with excitement over my imminent trip to Europe, but has instead been filled with quite a bit of panic. It hasn't all been bad, but it certainly hasn't been wonderful. My dad is officially retired and we've had lots of fun spending time together. My mom and sister booked their flight to Italy to visit me on Cesca's Spring Break. This is where I get to the "worst start" ever thing. First of all, on New Year's Eve, Cesca and I got into a minor car accident. Actually, I guess since it was at 12:30 at night it was technically the New Year. Yeah. We were at an intersection and turning left and Cesca didn't know the other side didn't have a stop sign and BAM. Collision. Luckily we have insurance and the car wasn't anywhere near totaled. It was my dad's car, and coincidentally it had a bunch of key scratches on it from some douche-bag at work who keyed his car, so they fixed that when they did the repairs. So something good came out of it, I guess. Thursday, January 12th, I began to feel pain in my back left cheek when I swallowed, spoke or brushed. This concerned me. I scheduled a doctor's appointment because my throat and ear were hurting. I heard a bunch of theories, from ear infection to the flu, because sore gums are sometimes signs of this, but during the weekend, the pain slightly worsened and I had my mother call the dentist. 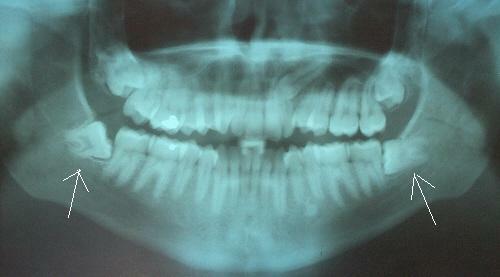 Monday: Dentist 9:45 a.m. X-ray of wisdom teeth. The news: those babies need to come out pronto, or I was going to be in a lot of pain and susceptible to infections for the next 4 months in Italy. The plus side was that only the bottom two were an immediate concern since they were coming in sideways. The top could wait. After getting a little hysterical at the timing, I got some more unfortunate news when scheduling surgery for as soon as possible: The dentist who does oral surgery was in Rochester, an hour and a half away, for the next week. Worse news? He didn't have any open appointments for full sedation, only for local anesthetic. Me= terrified. Everything I'd heard about the surgery was that you wanted to be out like a light for that crap. I spent the rest of Monday psyching myself out by reading forums, FAQs and articles which gave me no indication of how the surgery was gonna go. Many had horrible stories, many said it was simple. I called my cousin in Chicago, a dentist, and talked it out with her. She used to work with my dentist's office and knew the surgeon, and assured me he was good, and that I would be fine. Still wracked with nerves, I barely slept and at 11:30 hopped in the car with my parents to drive the hour and a half to Rochester to get those bad boys out. I was nervous as hell when they called me back for a third time (the first two were for x-rays and I almost had a heart attack when they called my name the first time) and I went to the chair. The doctor was nice and friendly, explained the risks and told me to say hi to my cousin when I told him I already called her to get the low-down. He said my teeth weren't in a bad position and it wouldn't be too bad. I was shaking like a leaf and my heart was racing. The receptionist in my home office said she listened to music while the operation was happening and it was fine, so I asked if I could. They had no problem with it. I put on my Tangled songs and waited to begin, figuring I would at least get to my Phantom part of the playlist. I got numbed up during When Will My Life Begin? and they told me the worst was over. Now, I don't find Novocaine shots to be that horrible, so I was still worried. Two songs later my mouth was numbed up and they were ready to begin. I got to I See the Light on my playlist as they began the extraction. I got through that song and the Italian version, and about 10 seconds of Think of Me from Phantom when they declared the surgery over. I hadn't really felt anything but pressure, thankfully, but I could tell I looked awful cause the gauze pads were making my cheeks puff out like a chipmunk. I couldn't believe it was over. My parents were shocked as well. It's taking me like 3 times as long to write this than it took the guy to pull out my teeth. I wish the recovery went that well. Day 1 after the surgery was painful (especially since I had to change my gauze on the go in the car, since we weren't home yet) but manageable. I took my Vicodin with some applesauce, barely able to open my mouth wide enough or get my tongue to function. The anesthetic is supposed to wear off in like an hour. It takes me like 2.5. My mom helped me ice my face on and off and things seemed to go well. Day 2 is where the trouble started. I was eating small amounts of soft foods and feeling ok, but I needed some pain meds. I took the Vicodin a while after my antibiotic that is supposed to make sure I don't get infections, and felt good for a few hours. However, I began to feel mildly nauseous by midday, and in mid afternoon it got super bad. My mom called the doctor and he told me to stop taking the pills because I probably couldn't handle them. I can't. Bright side? I will never be a pain pill addict. My body can't handle them. After a few more hours of nausea and hovering near the bathroom, the ginger ale I was forcing down finally did it's job and the nausea all but stopped. Today I'm doing much better, though I'm currently the world's slowest eater and I'm not all that hungry yet even though I haven't eaten much. Gotta get my strength back for Italy! On the plus side, IES called me yesterday (they called like an hour after my surgery and my mom told them I couldn't talk) and the lady told me they heard about my surgery, and wanted to assure me that if I needed any post-op help, they could find me an English speaking doctor/dentist/surgeon. That was comforting. I'm hoping I'll be mostly good to go by then. Can't wait to go through this process again when I'm back to get the top two removed... Oh well, gotta concentrate on finishing touches for Italy! Finally got my home stay info! My host mom has a cat! Score!